After taking some time off to raise her two boys, George (12) and Maxwell (8) Elizabeth started working with our firm June 2018. Elizabeth is a lifelong Insurance Producer, licensed and working in the business for over 30 years. She started in the business working for her Father’s Insurance Agency, Security First Insurance, in Flint, Michigan, servicing and selling property casualty. After working there for almost 10 years, she decided to move down into the Detroit area and began working for a Third Party Administrator, selling Self-Funded Employee Benefit and Workers Compensation plans. From, there she moved into the Life Insurance Business, where she worked for and ran the Detroit Branch of Pacific Life and then John Hancock and Phoenix Insurance Company. 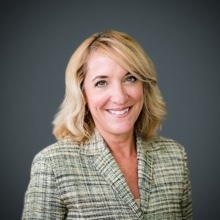 During her long career in the Insurance Business, she has always been a member of the different associations, MAIA, Young Agents, and NAIFA, where she became one of the 1st female Presidents of NAIFA-Greater Detroit Association in 2004. Elizabeth has always enjoyed working with Financial Planners and Insurance Brokers, over her long career and knew that after getting married and having children she would come back into the business. She currently resides in Grosse Pointe Farms, with her Husband Steve and her two boys. When Elizabeth is not working she enjoys spending time with her Family in Northern Michigan, boating on Lake St. Clair and up in Charlevoix in the summers and when fall and winter hits, watching her two boys play hockey.